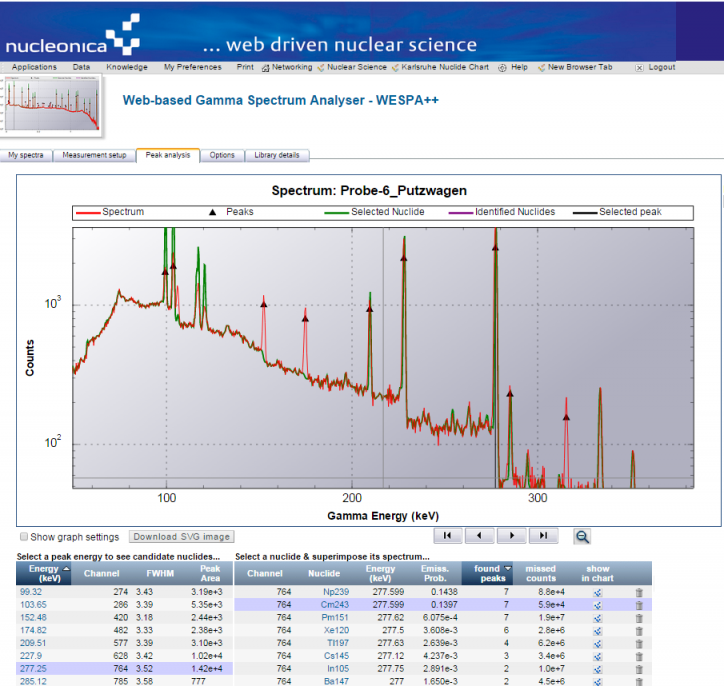 WESPA (Web-based Spectrum Analyser) is an interactive peak-search based gamma spectrum analysis tool for nuclear and radioactive material identification. Through an intuitive interface, it allows the user to assist in the nuclide identification process. WESPA can process spectral files with the IAEA *.spe format directly. Other formats need to be first converted using the Cambio file converter application in Nucleonica. The WESPA application in Nucleonica has undergone a major revision. The new version of the application has been renamed to WESPA++: to denote the new and improved features. – once an energy has been selected, the list of candidate nuclides is listed in the grid and arranged according to specific weighting factors. The most important of these weighting factors is the number of peaks common to both the sample spectrum and the candidate nuclide. If the number of common peaks is high, then this is a strong candidate nuclide in the sample.